Kent and Heather cruising friends from our time in the Caribbean and Portland, Oregon join us for a few days on the boat in La Cruz/Punta Mita. 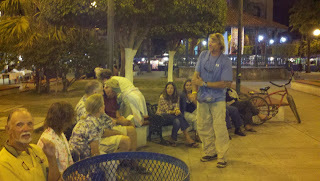 Meeting point... Huancaxtle Cafe, La Cruz for 10 peso draft beers. Dock Party at La Cruz. 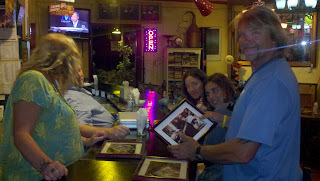 Tiffany, Dawn, Kathy, Kent, Heather and John. 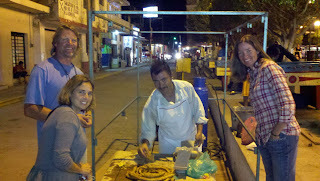 Tacos on the Street in La Cruz. 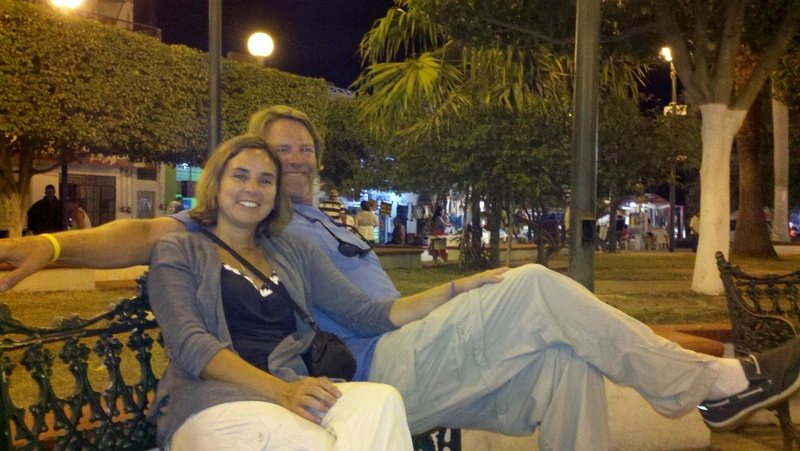 Heather at Tacos on the Street in La Cruz. We were very hungry and a little short on cash so all the coins came out so we could calculate the exact number of tacos we could devour. Sit down tacos. We sure are going to miss all the delicious and spicy Mexican cuisine. Tiffany and Kathy battle it out on a vintage Foosball table. Shell put give Buddy a little fright aboard s/v Michaela. Happy hour on the beach at Punta Mita. A crew of brave cruisers eating street hamburgers from a 'Hot Dog' stand on the back streets of Punta Mita. Spectators for for the infamous 'Circo Black Power' circus grab a group photo before the show. For twenty pesos we had more than our moneys worth of laughs. 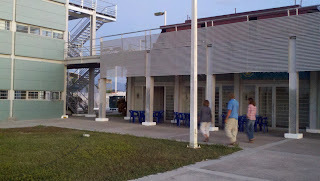 Socializing at the Marina Fontur in San Blas at the dinghy dock . 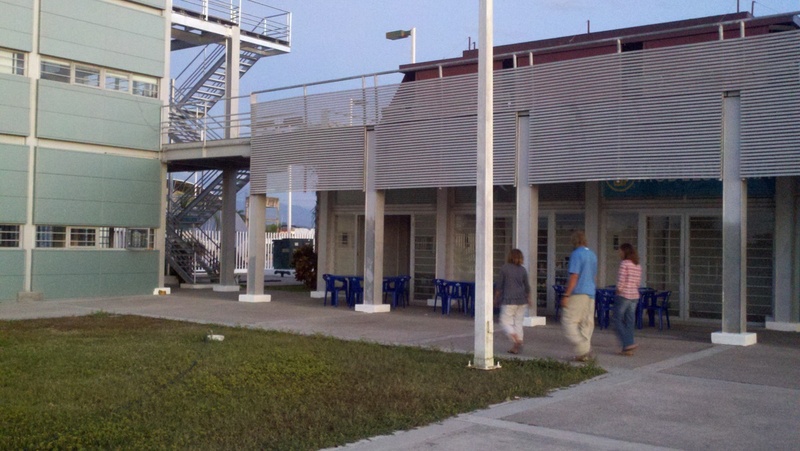 Heading through the Fontur Marina San Blas which looks identical to the buildings in Puerto Escondito. Kathy and Tiffany sign Norm Goldies guest book in the Zocalo (town square). Crews of s/v Decade Dance, s/v Michaela and s/v LightSpeed stop for a chat with Norm and Jan Goldie in the Zocalo, San Blas Mexico. Zocalo statue and cool old church with neon crosses. Tiffany and John of s/v Michaela take a break in the Zocalo. Churros for dessert were ohh so good. 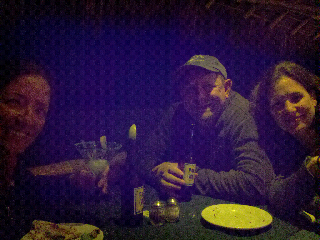 Nightcap at BillyBobs with John and Tiffany of s/v Michaela. Labels: Norm Goldie, s/v Decade Dance, s/v LightSpeed, s/v Michaela, San Blas Mexico. Fresh Snapper and prawns at the public market in San Blas. John, Tiffany and Kathy check out the various offerings of the fish mongers. Lobster, prawns, shrimp and plenty of options for fish. Flea Market Saturday on the runway? Looking down the San Blas runway you can see vendors starting to set up booths. Near noon nearly the entire airstrip was crowded stalls, food courts and shoppers. We bought at least 15 articles of clothing mostly thrift shop type stuff with prices that ranged from 15 pesos to 50 pesos each. Kathy picked up 7 pairs of shorts alone. Requisite photo of Shell as we are now officially crazy cat people. Rainbow lands on Fontur Marina in San Blas. Jungle tour with John and Tiffany of s/v Michaela and their dogs Thelma and Buddy. Kathy and Tiffany take their turn guiding us through the twists and turns of a side channel off the main estuary. Side streets of San Blas. Fresh watermelons are in season. Gorgeous ruins of Templo de la Virgen del Rosario built in 1788 on the hill near the La Contraduria Fort. 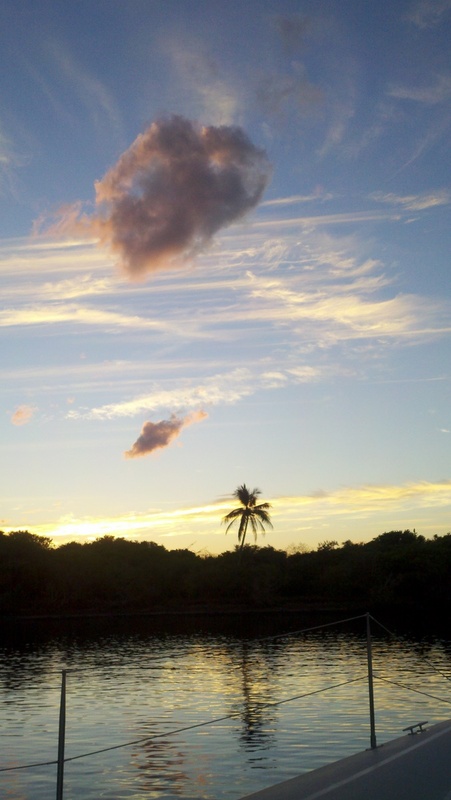 The view from the La Contaduria Fort overlooking San Blas is well worth the walk. We walked up in the later afternoon and fell prey to lots of mosquitoes, so maybe mid-day would be a better time for a visit. 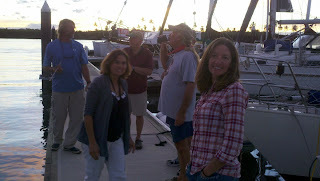 Group photo at La Contaduria Fort with John and Tiffany of s/v Michaela, Kathy and Dave s/v LightSpeed. This 18th century Spanish fort guarded the amassed riches prior to shipping to Mexico City. Check out the wire cage full of plastic bottles and containers. These are all over San Blas, not sure what happens to the plastic next, but we hope it gets recycled. Three ice cream cones for a total of 8 pesos or about $0.25 USD each. Yes, the cost of living is very low. San Bla? Not sure why they painted out the 'S' on this sign on the way in to San Blas. 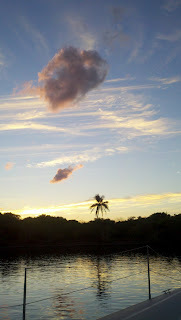 Sun sneaks on last peek down a side street of San Blas. 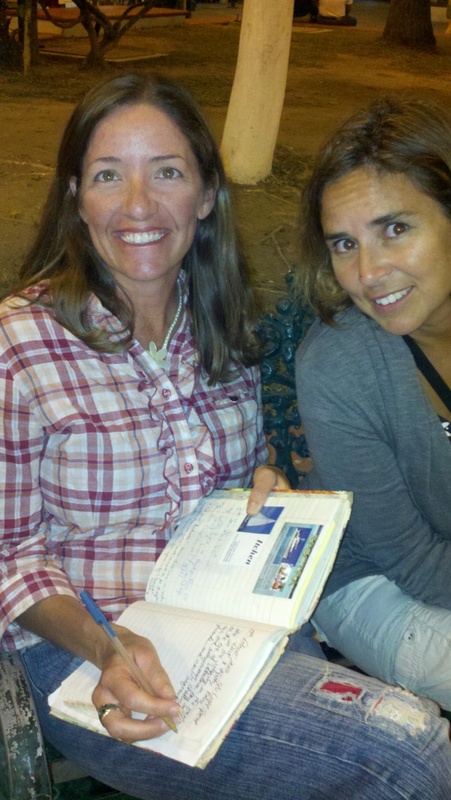 Kathy and Tiffany check out some of the beautiful bead-work jewelery made by a indigenous Huichol woman selling her art in the Zocalo. 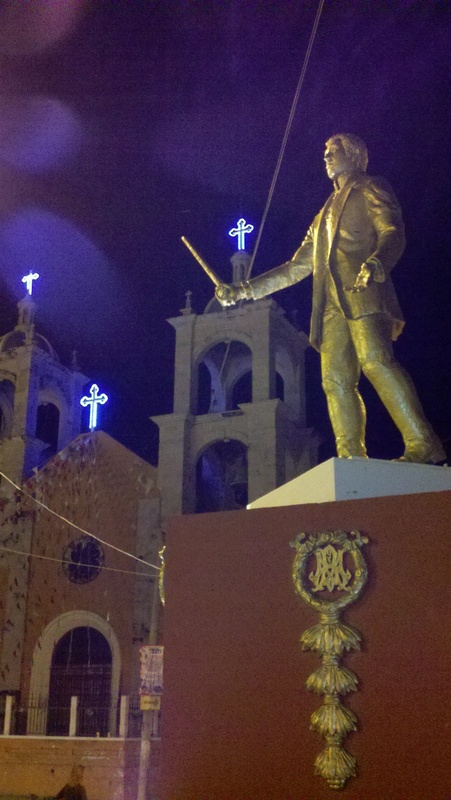 Cathederal on the town square or Zocalo in San Blas. Kathy finally gets to work on her tan. The old saying Red Sky in morning sailors take warning held true as the weather got ugly. Lobster condo project nears completion. These are lobster shades built by fishermen that hope they'll fill up with lobsters overtime. View of South East end of Isla Isabela from the Light tower.